Alifu Alifu Atoll, also known as North Ari, is a widely popular dive destination in the Maldives. After Kaafu Atoll tourism development moved to Ari Atoll, mainly because of it’s close proximity to Ibrahim Nasir International Airport. So there are many islands in the atoll which was also a contributing factor to its popularity in the tourism. Local guesthouse business is rapidly growing in Alifu Alifu Atoll. Regular speedboat ferries are operated to islands in this atoll. If weather is good there is ferry every single day and price is very affordable. Speedboat ferries combine people who are travelling to different islands in Alifu Alifu Atoll. Depart is always from Male’. It takes less than 2 hours by speedboat. Since the atoll is close to Male’ and the international airport there is no domestic airport in this atoll. As you can see there is no airport marked on the map. Close proximity to the main airport makes this a favourite destination of holidaymakers. 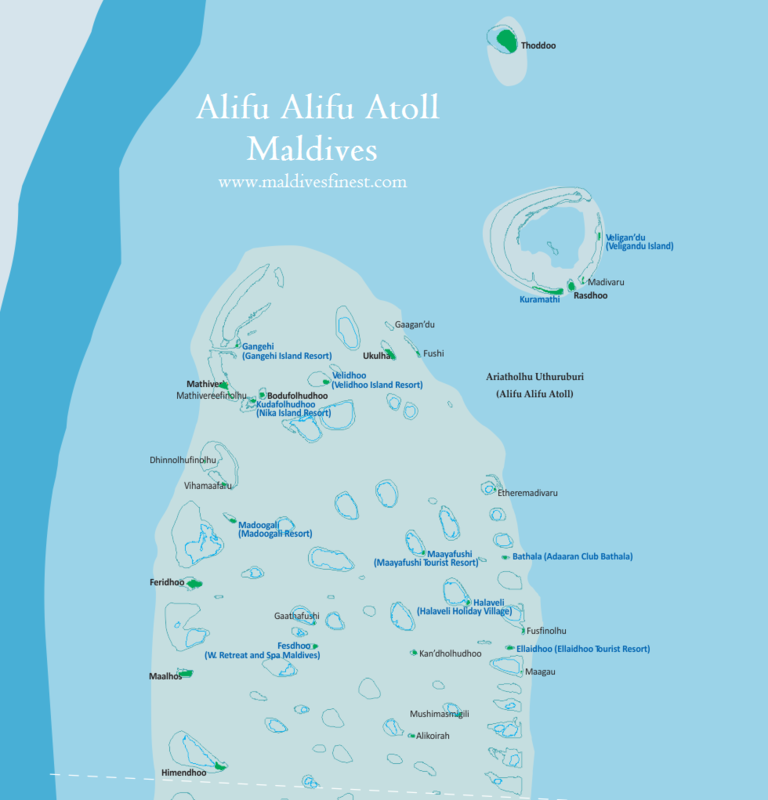 The maps shows most of the islands in Alifu Alifu Atoll are actually resorts. Very few islands are left out as dessert islands of which some may already be in construction. On map the resorts are marked in blue colour. You can see almost every single island is occupied, either for tourism or for local residential purpose. Maldives follow one island – one resort concept, resorts are combined with local residents. On the other hand there are guesthouses on local islands. So, you get the choice weather you want to stay among locals and enjoy local restaurants or stay in exclusive resorts. There is a big price difference and both are popular among tourists. This atoll is also referred as Maalhosmadulu Uthuruburi in official documents. Uthuruburi means north sector.